What's telling about the first seven months of 2017 is that the Steamboat Springs real estate market is substantially stronger this year than it has been since before 2010. Dollar volume through the end of July has historically increased over time, but in 2017 we've already seen a healthy 25.55% jump over the year-to-date numbers for 2016. Not only has dollar volume sold proved to be strong, but the total number of transactions so far this year is interesting to note as well. We've seen a 7.85% increase in transaction over 2016 and more transactions total than any year since 2010. The inventory that has been introduced to the market this year seems to be selling and certain price points remain extremely coveted by our current buying pool. Click to download the full report from Land Title Guarantee Company. 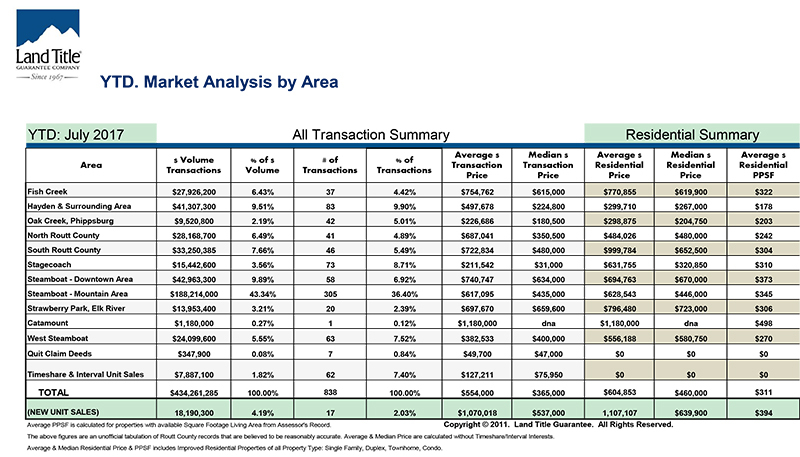 Looking at the market by area (full 2016 vs. YTD 2017) the average price for a single family home has increased over the past year in Stagecoach (104%) and the Steamboat mountain area (10%). Surprisingly, average home prices fell in areas such as West Steamboat (-6%), Strawberry Park (-26%) and North Routt County (-47%). Average prices for a single family home in downtown Steamboat Springs have remained generally flat at just a 1% increase year-over-year. Examining where sales are occurring, the mountain area surrounding the Steamboat Resort continues to host the most activity. 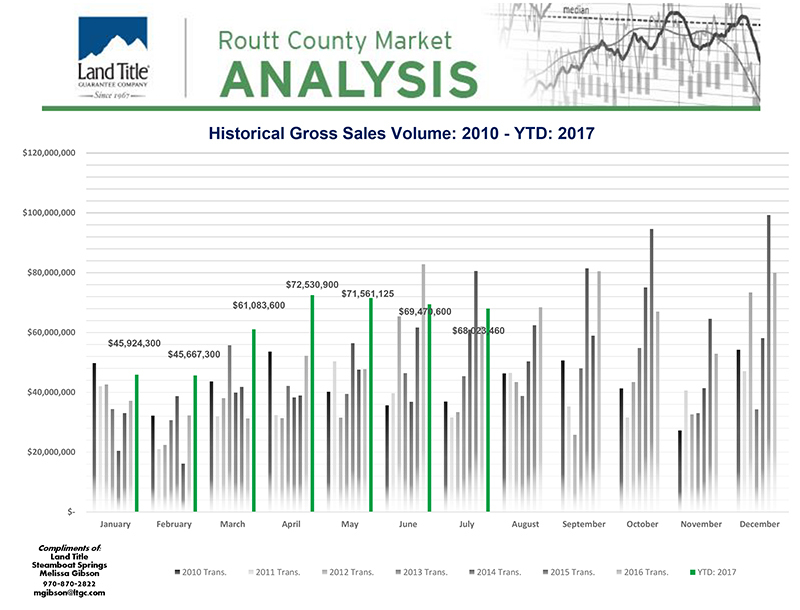 Over 43% of all dollar volume sold so far in 2017 happened in this area while another 10% was sold in downtown Steamboat. But when you add together the percent of total volume for Stagecoach the rest of South Routt County you'll see that over 11% of total volume was accounted for by sales in this region. As average home prices in Steamboat Springs continue to escalate, it appears that more and more buyers are searching for property to the south of town.